VIDEO: Tornado Roars Through St. Louis Airport Concourse : The Two-Way When a tornado struck Lambert-St. Louis International Airport Friday night, a security camera caught some amazing footage as things went flying. No one was killed by the storm that also destroyed about 100 homes. 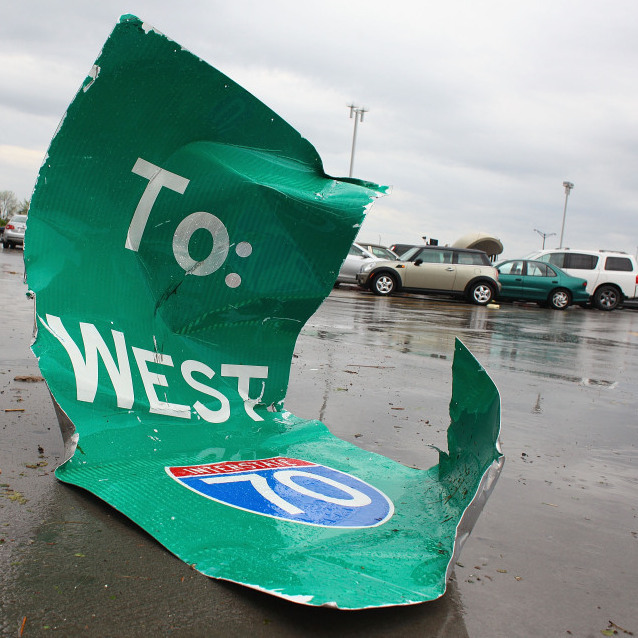 On Saturday, after the tornado, this highway sign sat in a parking lot at Lambert-St. Louis International Airport. This is frightening. When a tornado struck Lambert-St. Louis International Airport Friday night, a security camera caught some amazing footage as things went flying in one concourse. Amazingly, there were no deaths reported from the twister, which along with the extensive damage at the airport also destroyed up to 100 homes. Officials credit "early warnings, good timing and common sense," The Associated Press says. As for operations at the airport, officials say flight schedules are almost back to normal.